TheTrolls.net • View topic - how many Grand Slams would Agassi won without meth? how many Grand Slams would Agassi won without meth? 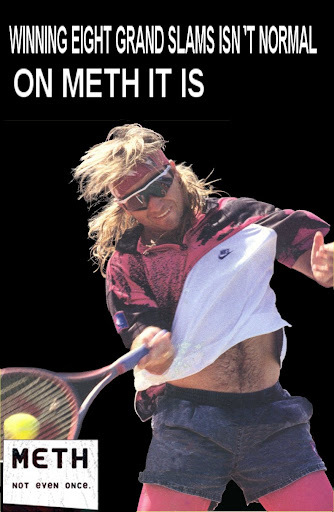 Post subject: how many Grand Slams would Agassi won without meth? Whoa, this is a surprise. Irie Lagos, your thoughts? TENNIS legend Andre Agassi, winner of eight Grand Slams, used crystal meth in 1997 and will describe the experience in his forthcoming autobiography. His admission will appear in excerpts of the book that are scheduled to appear in media around the world later this week. The quotes will be part of an series to be published in The Times, The Australian reports. In his book, Agassi recounts sitting at home with his assistant, referred to only as Slim, and being introduced to the drug. "Slim is stressed too ... He says, You want to get high with me? On what? Gack. What the hell's gack? Crystal meth. Why do they call it gack? Because that's the sound you make when you're high ... Make you feel like Superman, dude. "As if they're coming out of someone else's mouth, I hear these words: You know what? F*** it. Yeah. Let's get high. "Slim dumps a small pile of powder on the coffee table. He cuts it, snorts it. He cuts it again. I snort some. I ease back on the couch and consider the Rubicon I've just crossed. "There is a moment of regret, followed by vast sadness. Then comes a tidal wave of euphoria that sweeps away every negative thought in my head. I've never felt so alive, so hopeful - and I've never felt such energy. "I'm seized by a desperate desire to clean. I go tearing around my house, cleaning it from top to bottom. I dust the furniture. I scour the tub. I make the beds." Paul Bogaards, director of media relations at Knopf, a division of Random House said, "Those excerpts contain revelations about Andre's use of crystal meth when he was a tennis player." The information was first made public today via the Twitter feed of Richard Deitsch, a writer for Sports Illustrated. "FYI: There's an off-the-charts book excerpt from Andre Agassi in the forthcoming SI: He admits to taking crystal meth during his career," said the message, which was removed shortly after it was posted, according to the New York Daily News. One of the most beloved players in the annals of the US Open, Agassi retired in 2006 after 20 years in professional tennis, having won eight Grand Slam championships, 60 singles titles, and a total of $31 million. Agassi, 39, often made news for his brash style and high-profile romantic relationships. He is married to tennis great Steffi Graf, and they have two children. He is also an acclaimed philanthropist whose school in Las Vegas for underprivileged kids has become a national model. In writing the book, Agassi worked closely with Pulitzer Prize-winning writer J.R. Moehringer, author of The Tender Bar. Post subject: Re: how many Grand Slams would Agassi won without meth? Madness is only the first step in becoming what I am. 12, not counting the extra cayshe he would've made from a Sudafed endorsement deal. Track and field records soared off the charts after WW2 where such medical "treatments" were used by troops to maintain alertness and stamina during combat. We'll probably never know the extent of drug use in athletics and maybe it is best we don't. Meth use isn't the only thing Andre's admitting to these days. LONDON — Former tennis star Andre Agassi has admitted the lion mane-style hairstyle he sported during the 1990s was actually a wig, in extracts from his autobiography published in British newspapers Saturday. Agassi said he wore a hairpiece held together with pins in his first Grand Slam final, the 1990 French Open final, and blamed his concerns that it would fall apart for losing the match to Andres Gomez. Before the match he prayed "not for victory, but that my hairpiece would not fall off", he writes in "Open". In previous excerpts, Agassi admitted he had used the drug crystal methamphetamine in 1997. He said he started to wear a wig to disguise hair loss. "Every morning I would get up and find another piece of my identity on the pillow, in the wash basin, down the plughole," he wrote. "I asked myself: you want to wear a toupee? On the tennis court? I answered myself; what else could I do?" But the wig began to disintegrate as he took a shower the night before the Paris final -- "probably I used the wrong hair rinse," Agassi writes. He panicked and called his brother Philly into the room. Together, they managed to clamp the wig together using clips and pins. Agassi, 39, writes: "Of course I could have played without my hairpiece, but what would all the journalists have written if they knew that all the time I was really wearing a wig? "During the warming-up training before play I prayed. Not for victory, but that my hairpiece would not fall off. "With each leap, I imagine it falling into the sand. I imagine millions of spectators move closer to their TV sets, their eyes widening and, in dozens of dialects and languages, ask how Andre Agassi's hair has fallen from his head." It was actress Brooke Shields, who he married, who persuaded him to cut off all his remaining hair. "She said I should shave my head," he said. "It was like suggesting I should have all my teeth out. "Nevertheless, I thought for a few days about it, about the agonies it caused me, the hypocrisy and lies." But after taking the plunge, "a stranger stood before me in the mirror and smiled," Agassi said. 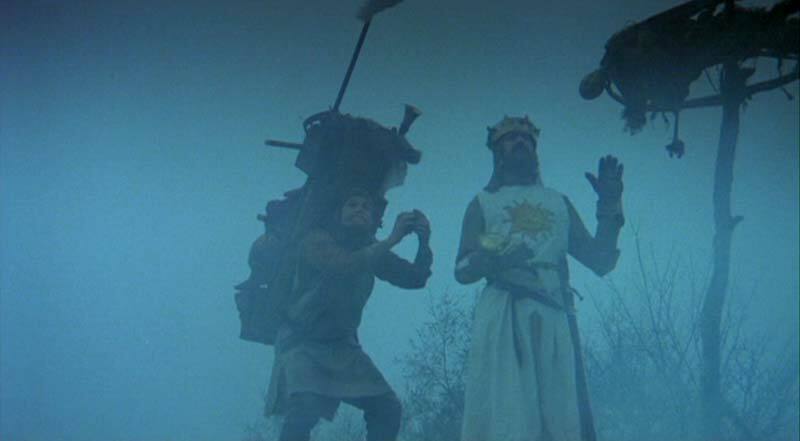 "My wig was like a chain and the ridiculously long strands in three colours like an iron ball which hung on it." Agassi won eight Grand Slams during his career and is one of only six men to win all four major titles. That pic could use an alternate caption.